Being one of the largest indigenous groups in Sabah, Murut comprise of subgroups such as Baukan, Gana', Kalabakan, Okolod, Paluan, Sulangai, Serudung, Tagal, Timugon and the Beaufort and Keningau Murut. Literally "Murut" means "hill people". They inhibit the interior and southeastern parts of Sabah and the territory straddling the Kalimantan and Sarawak borders. They are mostly shifting cultivators and hunters with some riverine fishing. Those of Murut origin speak 15 languages and 21 dialects. The language commonly used and understood by the large majority is Tanggal. 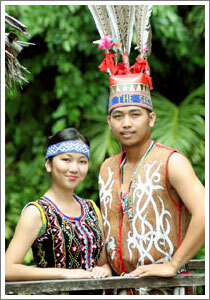 Their language is also related to the Kadazandusun languages. Once feared as fearless headhunters and longhouse dwellers, the Murut these days have abandoned much of their age-old traditions especially headhunting. They are also very skilled in hunting with blowpipe. In the by-gone era, collecting heads of enemies served a very precise function in Murut society. A man can only get married after he has presented at least one head that he has hunted to the family of the desired girl. Heads also play a very important role in spiritual beliefs. The essence of Murut tradition of feasts is distinctive. No merrymaking will end at least until sunrise and can last up to seven days later. This is especially the case with weddings or funerals. Through modernization, no more heads must be furnished for weddings but jars along with cloth, beads, gold and ivory bracelets have taken its place. All these dowry items will be proudly displayed at the ceremony. Jars or "sampa" holds a prominent status in their customs. The Murut know the age of sampa and treat them will due respect. Jars are also a place of spirits. Beads play an integral role in Murut life. Wedding beads must be presented in the form of belts, necklaces, headgear and decoration. The wedding ceremony must be held in the bride's longhouse, tapai or rice wine must be served and all the meat has to be pickled. The Murut keep the bodies of their deceased in a jar and place them in colourful and elaborately decorated grave-huts along with the deceased's belongings. The body will be placed in the foetal position inside the jar and a gong will be placed over the mouth of the jar to close it. However this custom of burial is becoming rare with the availability of wooden coffins.